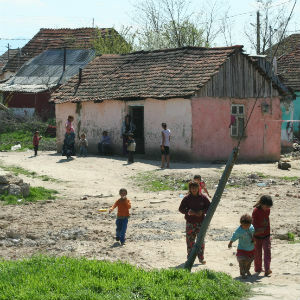 Certain of the ministries we support represent ongoing projects for us in Romanian Ministries. Following them through the years has certainly been interesting, and it’s been wonderful to often see the Lord’s hand at work. Our involvement with the Infants School for gypsy children in Batar now dates back almost four years, from before when its building had actually been completed. 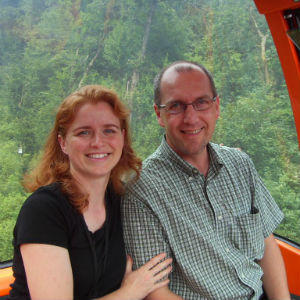 Marcel Lakatos, one of the pastors we support, was key in its ever being built. 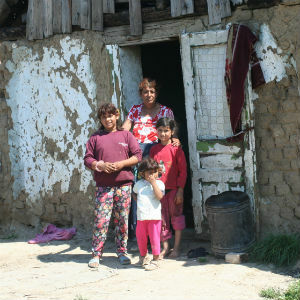 Living in the village of Batar, and long aware of the problems children faced through a lack of education, his dream to build an infants school seemed destined to stay just that until he was put in touch with a successful Christian entrepreneur named Mihai Dehelian. Mihai had recently sold his chain of seed shops, and was looking to invest a tithe of the proceeds in a worthwhile Christian project. Marcel outlined his vision of a Christian infants school, and believing it to be from the Lord, Mihai soon agreed to provide the necessary finance for its construction. Payment of ongoing school costs, however, has been something of a problem. The Romanian Government supplies funds for only one of the two teachers in the school, with the teacher of the other class dependent on donations. A small number of kind donors, through Romanian Ministries, have made a substantial contribution to this salary now for two years, with the Infants School providing many opportunities for witness to Marcel and his church. Titus, a married man with two children, has a long history of pastoral involvement and work with young people. For several years now, however, he has been arranging conferences throughout Romania and running courses which seek to challenge churches as to whether they are being governed along truly biblical lines. Our attendance at one of his evening training sessions in Spring 2013 confirmed the usefulness of what he does. Deacons and Elders from four local congregations converged on Cornel’s home church in the village of Draut. Some wagon-wheel sized pizzas were placed on tables, awaiting consumption, before the searching questions of the evening began. What is the vision of your church? How could this be supported from scripture? In what ways is it breaking new ground into the surrounding neighbourhood? Write down several possible ways in which this could be done! Concluding with a well applied video, and offering personal challenges in a sensitive manner, the benefit of the evening was extremely clear. Adrian still remembers one way in which the Lord spoke to him during session. When informed by Emi Moise (see Pastors section) that Titus is working by faith in this ministry, we were glad to be able to make a small gift towards his work for the Lord. An exciting opportunity for outreach came in Spring 2012, when a primary school in Cornel’s home village of Draut indicated that they would welcome some evangelical books for children. This was a wonderful opening. Whereas the secularisation of the education system so prevalent in the UK has not occurred in Romania, the collective might of the Romanian Orthodox church often stands against evangelical intrusions. Not, however, on this occasion. We had long known of a dear elderly Christian bookseller in the town of Arad, and so visited her for the necessary materials. Over sixty books were purchased, which we gave to the school as a resource for its lending library. This, we hoped, would ensure blessing for successive generations of pupils. We were delighted to be informed by one of the teachers, herself an evangelical Christian, that a large number of children had borrowed books following the first week of their arrival. This continues to this day, and we often supplement the original gifts with further titles for the library when we visit the area. 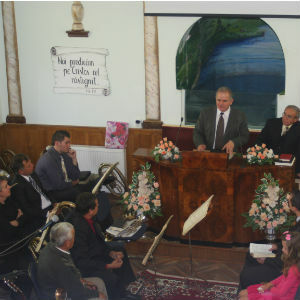 One of the customs that Romanian churches have and which fellowships in Britain could learn from is the holding of a week of evangelistic meetings at least once a year. Called an evanghelisare, visiting speakers are invited for each night, as well as others who might sing as soloists or as part of a small choir. The meetings are often held during the cold, dark winter months, when there are fewer rival attractions to discourage attendance. 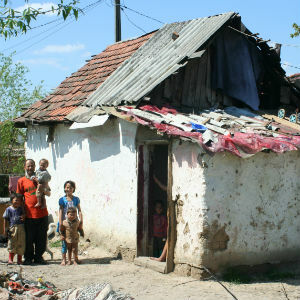 Romanian Ministries has helped pay for the cost of this important week in Cornel’s home church now for two years. Additionally, we have helped with paying for pulpit supply in a small congregation. The village of Araneag, well-nigh invisible on all but the most detailed maps of Western Romania, lost its regular Pastor when he departed to America to continue his ministry there. Sensing that this small yet valuable fellowship might struggle financially through its interregnum, Romanian Ministries gave some money towards the cost of obtaining weekly preachers. Mid morning sees Sora Ana sometimes take the children from her class outside and then take them through a range of slightly hilarious exercises. We cannot remember exactly what this one was meant to be – probably scanning the horizon for some distant threat – but the children took to it very well! As you leave the grandinita in Batar behind, this is the view of the village that greets you. Not too bad on a warm spring day,perhaps, but when winter comes, undeniably grim. 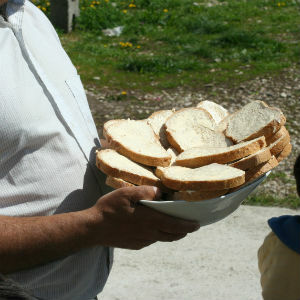 Pastor Marcel with a plate of the ever necessary but all too rare commodity in Batar – basic food. Oh dear. 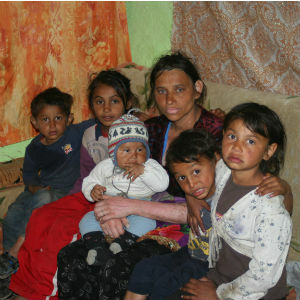 Certain gypsy families stand out for all the wrong reasons. This one very sadly, not simply because the mother had ten children, but because vitamin difficiency had caused a discolouration of the skin on her hands and arms. The vast majority of the children classified as orphans in Romania were not orphans in the normal sense, simply (if such a word can be used) those who had been abandoned by their parents. The three in the photograph, however, were orphans, and, as can be seen, their accommodation was below the most basic form. …and here they are outside. 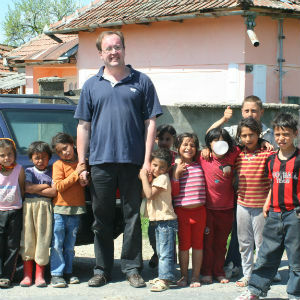 Adrian, with some of the children from the Gradinita. We’re been visiting Batar now for over four years, and have a strong emotional bond with the village.